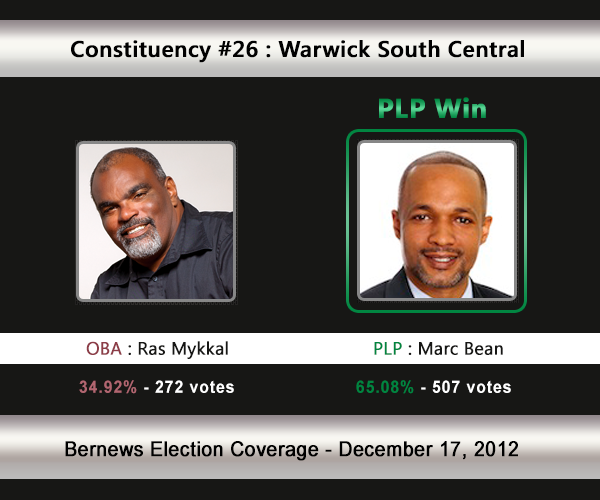 [UPDATE Dec 17: Election Results] Incumbent Marc Bean [PLP] has retained his seat against Ras Mykkal [OBA] in C#26 Warwick South Central. Incumbent Marc Bean is being challenged by the One Bermuda Alliance’s Ras Mykkal. Mr Bean won a 2010 bye-election with 67% of the vote in a three-way race. In 2007, Dr Ewart Brown [PLP] won 68.45% of the vote vs the UBP’s Roderick Simmons [562-252]. In the 2003 General Election, Dr Brown won with 65.99% of the vote against Gwyneth Rawlins [UBP] who received 34.01%. 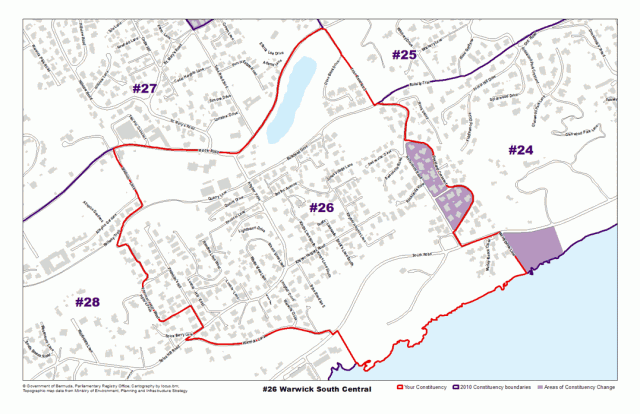 Areas the Warwick South Central constituency consists of, or is located by, include Middle Road, Tribe Road No. 3, the Railway Trail, Rocklands Road, South Road, Warwick Lane, Spice Hill Road, Pearman’s Hill and Stadium Lane. Marc Allan Raoul Bean was elected to the House of Assembly in December, 2010, as the MP for Constituency 26, Warwick South Central. He was appointed to the Cabinet of the Premier the Hon. Paula Cox JP MP, as the Minister of Environment, Planning and Infrastructure Strategy in November 2011. He had earlier been appointed to the Senate. In June 11, 2008, was appointed to the Senate as the Junior Minister of Tourism, Transport, Environment, and Sport, and later, the Ministry of Telecommunications, E-Commerce and Energy. A qualified air traffic control specialist, he also possesses a FAA commercial pilot’s license, with multi-engine, and instrument ratings. Marc was born in Paget, Bermuda. He attended Southampton Glebe Primary School, The Berkeley Institute, Delaware State University, Bailbrook College, and flight school in Atlanta, Georgia. His contribution to the community is varied. He has served on the Bermuda Independence Commission, the Telecommunications Commission, the Public Transportation Board, The Public Vehicle Service Licensing Board, the Air Transport Llicensing Board, and as the Deputy-Chairman of the West End Development Company (WEDCO). His work received public recognition when, in 2006, he received the Queens Certificate and Badge of Honour. He previously worked in the, Dept. of Marine and Ports, and as the Recruitment and Enrolment Manager for the Mirrors program. He also served as the Government’s Advisor on CARICOM Affairs within the Office of the Premier. Marc is a proud father of 2 children. Unhappy with the current government, Ras believes that as an island we’re not coming together for support and identity—that we’ve given birth to people “who are feeding off the bottom” a trend, according to Ras, that puts everyone at risk.